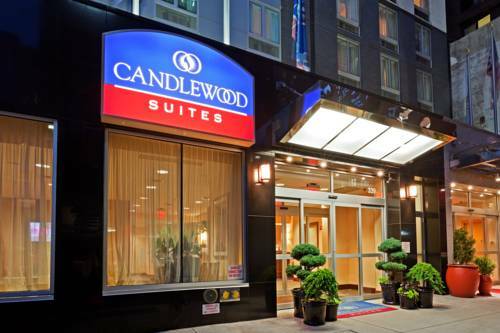 Surrounded by the electrifying Times Square, Candlewood Suites New York City Times Square has the perfect location for Extended Stay business and leisure travelers. Our NYC hotel is convenient to the major businesses in Times Square and the attractions of New York City. If you are traveling to "the Big Apple" for just an overnight stay or for a long stay, our NYC hotel's Studio suites with full Kitchen facilities will make your trip a smashing success. Our Times Square address places us within walking distance of the Jacob Javitz Convention Center, Madison Square Garden, Penn Station, Port Authority, Hudson yard, Ernst & Young, New York Times Building and Amazon among others. Our All Suite hotel offers a comfortable work space and free high-speed internet access. Leisure guests know that our hotel in NYC's Times Square is centrally located so it is easy to visit the best of the city; the electricity of Times Square, the majesty of the Empire State Building and the excitement of Broadway Theater are at our doorstep. All modes of transportation, from trains, buses and subways are nearby. Our extended stay Midtown Manhattan hotel offers a free 24-hour fitness center. We are a 100% non-smoking hotel. There is the Candlewood Cupboard, located in the main lobby, for food and sundries. We also offer free laundry facilities. Check out our great, extended stay New York City hotel deals including Breakfast. Classy Irish themed eatery and nightspot with occasional live music and a menu of New American entrees.